Monday - Thursday: 9:00 a.m. – 9:00 p.m. Hours may be different for summer and holidays. For the most current hours, check the signage outside the lab. 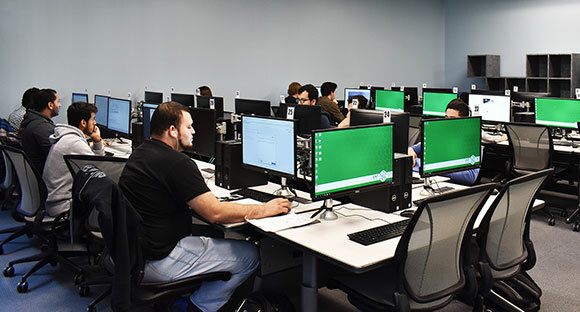 The College of Engineering (CENG) Student Computer Lab is open to all currently enrolled UNT students, as well as active faculty and staff. Anyone who wishes to use the lab must first present a valid UNT ID to be admitted access. Our computer lab is a part of the UNT Student Computer Lab system, and as such, follows the established SCL Procedures and Guidelines. We also have two group study rooms that can be reserved ahead of time or checked out on a first-come, first-served basis. If you need assistance, please see the lab attendant at the desk. All current UNT students have access to printing. You will automatically receive a printing credit each semester which can be used in any of the UNT computer labs. All printing is intended for academic use only. The CENG SCL does not support or provide personal printing in the facility. We appreciate your feedback and want to know how we can improve. If you have any suggestions or if you would like to give general feedback on services or staff, send us an email or ask to speak with the Lab Supervisor. Thank you!